A patient goes to the foot doctor complaining of HEEL PAIN. The heel hurts when the patient first gets out of bed and after periods of inactivity. The problem can last for months, become chronic and the patient is forced to seek medical attention. This condition is known as Plantar Fasciitis, heel pain or heel spur syndrome. It is caused by an inflammation of the strong ligament along the bottom of the foot. In most cases, conservative care usually solves the heel problem and the foot gets better. If neglected, a heel spur may develop. A conservative treatment called Shock Wave Therapy (ESWT) is proving to be a successful method of resolving heel pain without surgery. This procedure can be provided in our office and takes about 20 minutes. "When identified early, Neurolysis can replace surgery and resolve the problem." A patient comes to the office complaining of burning foot pain in the ball of the foot. Sometimes the burning foot is accompanied by numbness in the toes. Frequently the pain shoots along the foot and up into the leg. Often the patient will have to sit down, remove their shoe and rub their foot. Some days it is worse than other days. Finally the patient is forced to seek a podiatrist. This condition is called a Neuroma. It is a thickening of the nerve to the toes as it passes through the ball of the foot. As the nerve thickens, it is damaged by the pressure from the bones and causes loss of feeling in the toes. In the past, surgical removal of the nerve was the usual treatment. Now a procedure called Neurolysis can resolve the problem without surgery. The procedure is done in the office and can require several treatments before the neuroma symptoms subside. There is no disability or loss of work with Neurolysis. Dr Steven Marder, please call 732-870-9700. At Dr Steven Marder Foot Care Center, we believe that a doctor and patient become a team for treating an individual's feet. Dr Marder spends time listening to understand your concerns and responding with the best treatment options for you. With the help of his professional staff, they also follow up to make sure that pain is relieved, problems are resolved and your health improves. That is why we've included an extensive section on this web site covering the full array of topics associated with podiatry and podiatric diagnoses and treatments. We encourage you to look through these pages whenever you have an interest or concern about your feet. We also know that convenience in West Long Branch and the Shore area is important to your selection of a podiatrist. 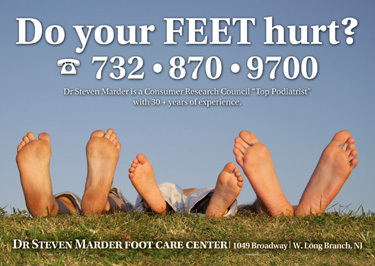 In these web pages you'll find information about Dr Steven Marder Foot Care Center's office, including our West Long Branch location, maps, directions, hours, insurance policies and appointment scheduling. Please feel free to contact | us with any questions you have or to request an | appointment. We hope you'll find our practice offers the accessibility and personal commitment you look for from a physician.